I am not very adventurous in the kitchen. Being a rule follower, I like to follow recipes. Like, to the T. I rarely deviate unless I just don’t have a spice or ingredient. Not sure why I’m like that other than the fact that if I do something I want it to turn out right the first time. I don’t want the ingredients and my time to go to waste. BUT LATELY, I’ve been experimenting in the kitchen. It might be a case of invasion of the body snatchers, but whatever, I like what I’ve been making! Tonight I actually took pictures as I was creating. 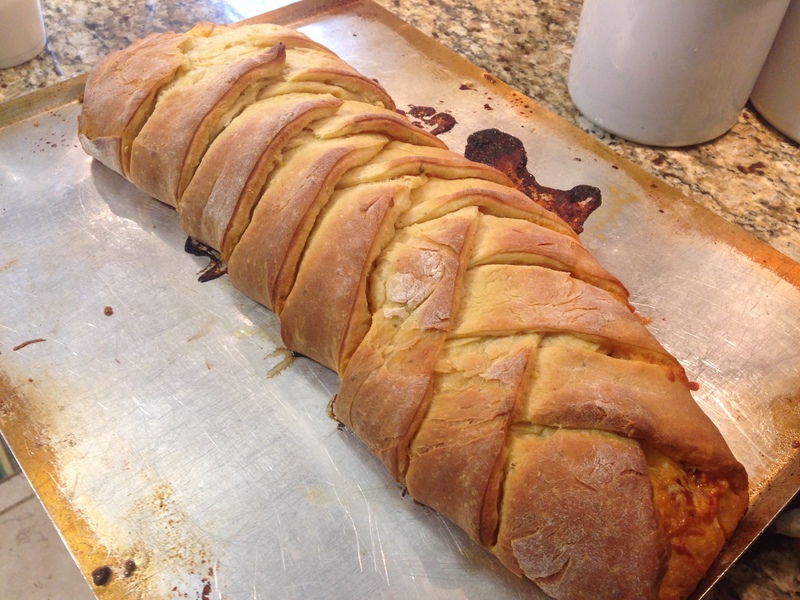 I know there have to be hundreds of braided bread recipes out there. I’m submitting mine for consideration. In the bowl of a stand mixer fitted with the paddle attachment, combine the 2 cups of flour, sugar, yeast, salt, and Italian seasoning. In a small saucepan over low heat, heat the milk and butter just until the butter melts. Add the water and set aside until warm (120º F-130º F), about 1 minute. Pour the milk mixture over the flour mixture and mix on low speed until combined. Add the eggs one at a time, beating well after addition. Add 1/2 cup more flour and continue to mix on low speed until smooth, about 30-45 seconds. Add 2 tablespoons of additional flour and mix on medium speed until the dough is smooth, but slightly sticky. Sprinkle the work surface with flour, and place dough on flour. Knead the dough gently until it is smooth and no longer sticky, adding an additional 1 to 2 tablespoons of flour if needed. 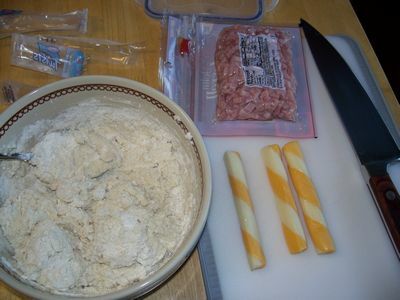 Place the dough in a large bowl and cover with plastic wrap. Let the dough rise in a warm, draft free place until it has doubled in bulk, about 45-60 minutes.Meanwhile, melt 1/4 cup of butter and add minced garlic and Italian seasoning. Let sit at room temperature to let the flavors mix.Once the dough has risen, gently de-gas it by pressing lightly. On a lightly floured work surface, roll the dough into a large rectangle (16 x 12 or so). Transfer to a baking sheet. (At this point, I wasn’t ready to bake it so I let it sit on the counter for maybe an hour.) 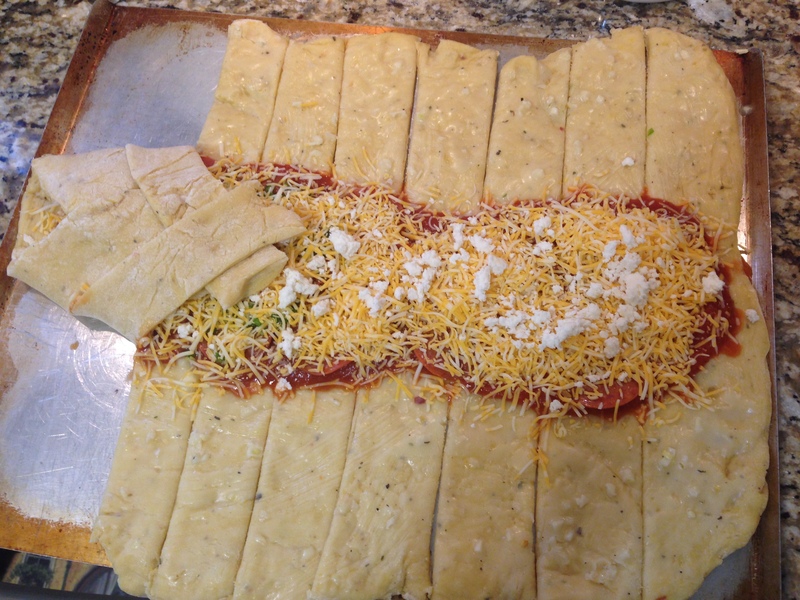 Using a pastry brush, spread the garlic butter evenly over the dough. 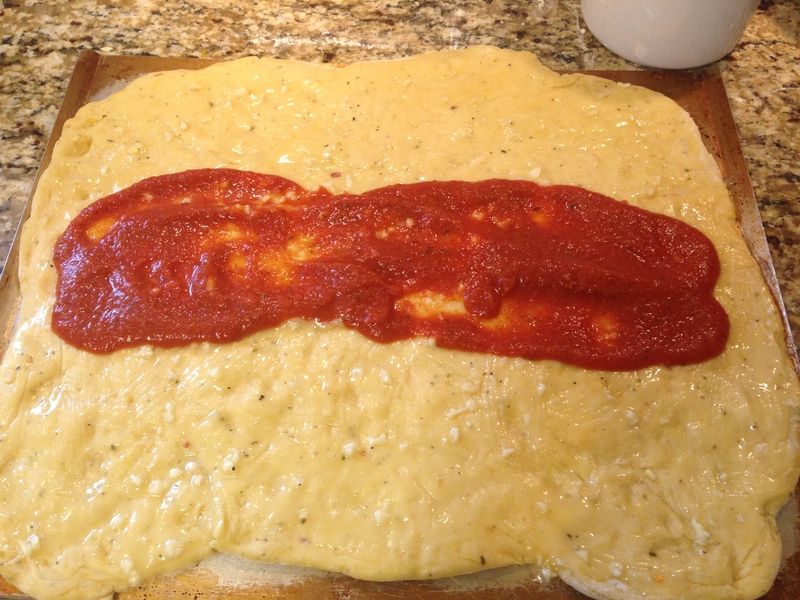 Spread the pizza sauce down the center of the dough (lengthwise). 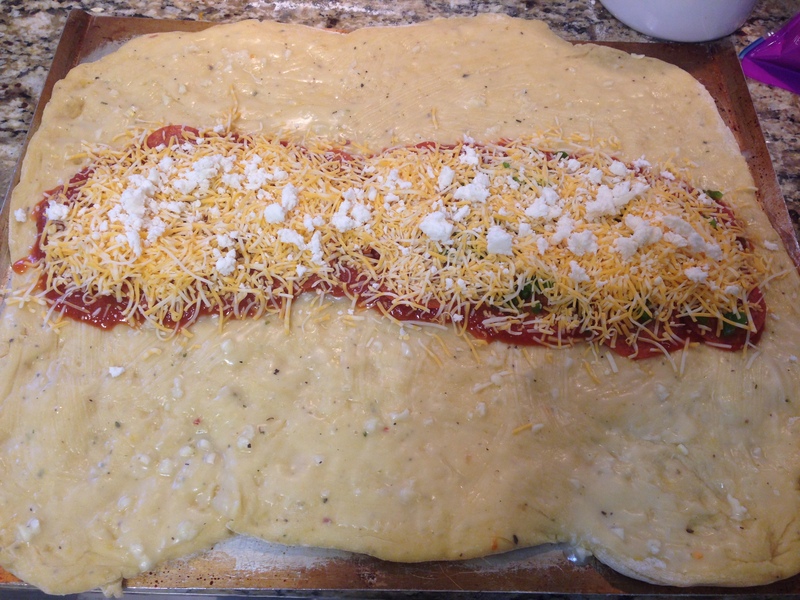 Layer pepperoni, cheese, jalapenos, and whatever else you want to add. 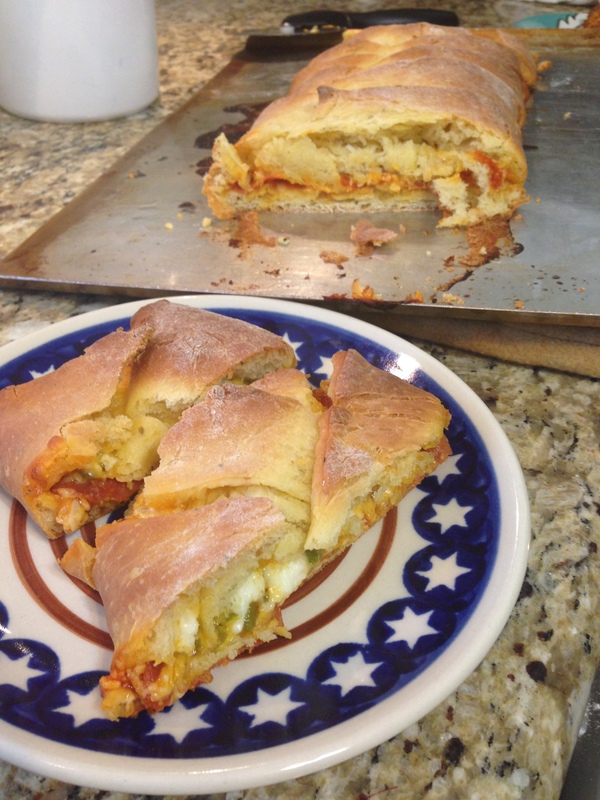 Using a knife or pizza cutter cut slits from the pizza sauce down to the outer edges of the dough. Mine were about 1 1/2 inches wide (maybe). 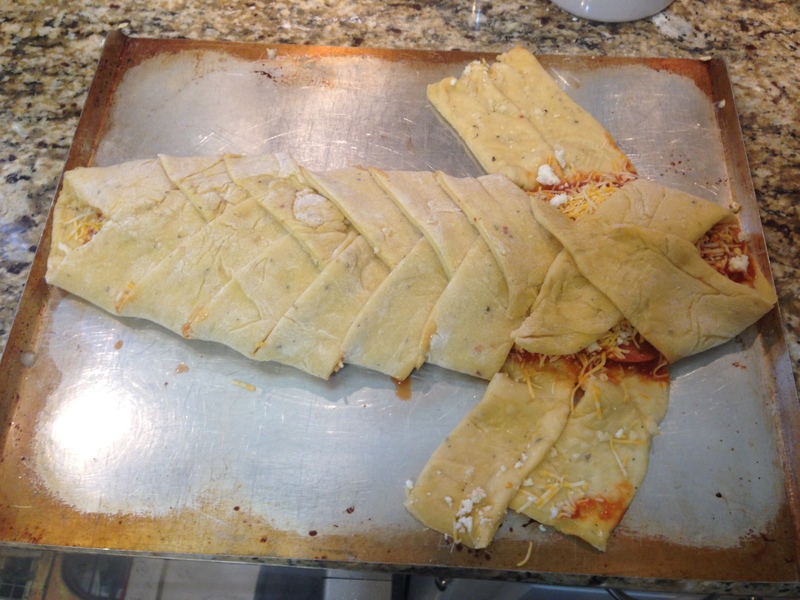 Starting at one end diagonally fold in dough strips, alternating sides. When there were three strips left on each side I folded up the open end and then proceeded until all the strips were folded over. The bread is light and airy, easy to cut through with a fork. At 6:30pm we were all outside playing happily and enjoying the sunshine when this question was floated my direction: “what’s for dinner?” Dinner? On the weekend? You mean that’s my job too? I’ve been She That Provides Life Sustaining Nourishment for years now. Why am I all of the sudden thinking I could take a break on the weekend? Truth be told I was so busy doing the bills and then having fun outside I lost all track of time. Plus, it’s the weekend. Haven’t we started paying someone to cook for us on the weekend? My response yesterday to this question, again at around 6:30pm, was “whatever you’re going to make us.” This was said to our six year old. In a loving tone, of course. And yes, I’m admitting that this is somewhat becoming a pattern for us on the weekend. Last night I quickly threw together breakfast for dinner. Usually breakfast for dinner includes some type of homemade dough concoction: pancakes, waffles, French toast; eggs, bacon and fruit. Last night it was frozen waffles and frozen sausage, egg and cheese biscuits. I know. I knew quick BFD (breakfast for dinner) would not go over well tonight. Mainly because we finished off all the “quick” breakfast items last night. Switching on that creative part in my brain (because I do not like to cook without a recipe…but I’m working on it) I opened up the pantry and prayed that we had something in there. I spied a couple of random items and decided to throw them together. I came up with pasta topped with Parma Rosa sauce. And whole wheat pasta at that. You didn’t even know I knew whole wheat pasta existed did you? Mix the bisquick dough and milk according to the directions on the box. 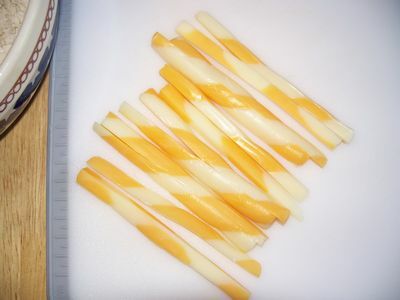 Cut the cheese sticks into halves and then halves again, lengthwise. Then dice them. 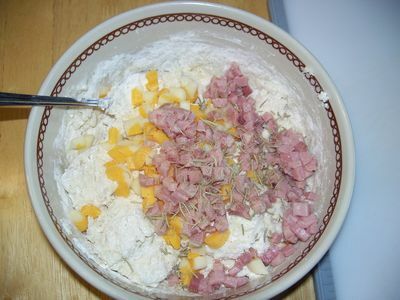 Throw these into the batter along with a handful of ham chunks. Add some garlic powder and rosemary. Knead as normal, form into biscuits as normal. Bake at 450 for about 10 minutes or until they look done. Y’all, these are yummy. 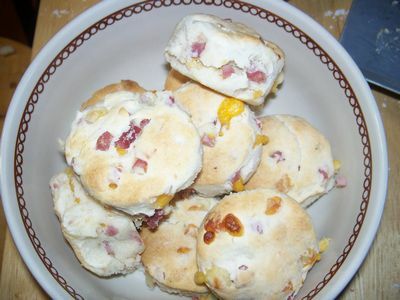 And don’t tell me you’ve seen ham and cheese biscuits before. Have you seen them with ham chunks and cheese sticks? They’re going to become somewhat regular in my kitchen. I say somewhat because I do not make the same food over and over again. My family has one or two dishes that we have every month. But other than that I do usually cook new dishes. When I remember to cook. What a weekend (it includes a fight)! We had a fairly eventful weekend and a good time as a family. 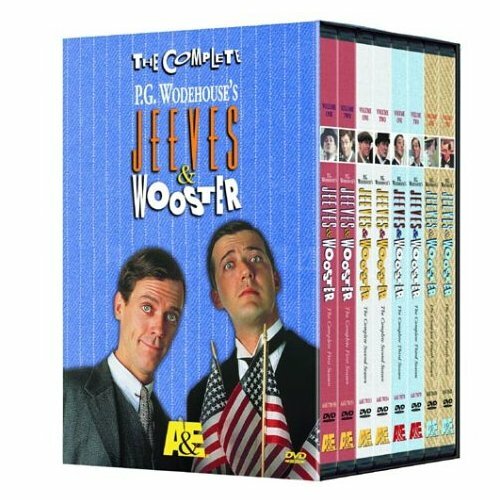 Friday night our neighbors came over for our weekly installment of the Jeeves & Wooster series. Can I say this is one of the greatest tv series ever put on tv? Cause it is. It’s clean, it’s funny, it’s British humor (which I am just beginning to understand and appreciate) and it’s got Hugh Laurie in it. And when he’s paired with Stephen Fry it’s even better (they also were together in Black Adder Goes Forth and some other shows). We got the complete series for Christmas and we’re trying to get them all watched before we move. Because our neighbors like J&W too (and they’re British so they can explain things to us that we would completely miss otherwise). 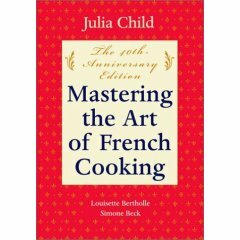 I made French Onion Soup from Julia Child’s book Mastering the Art of French Cooking, and it was fabulous. Saturday Du took Reagan to Lowes for their bi-weekly build it series for kids. This time they made a little Jimmie Johnson race car. Can anyone tell NASCAR will be back soon? Later we all went to the CMU Jennie’s basketball game. I think that’s the first women’s basketball game I’ve been to. Ashlyn was interested for most of the game. We were surprised at how well she did. Vienna sausages and a cheese stick might have helped do the trick as well. a kid slapping Ashlyn in the face while I was holding her. I kid you not. We were standing around the water fountain explaining to Reagan the dangers and just plain grossness of licking the fountain (don’t ask). I was holding Ashlyn in my arms when a woman walked out of the bathroom with her two young sons. 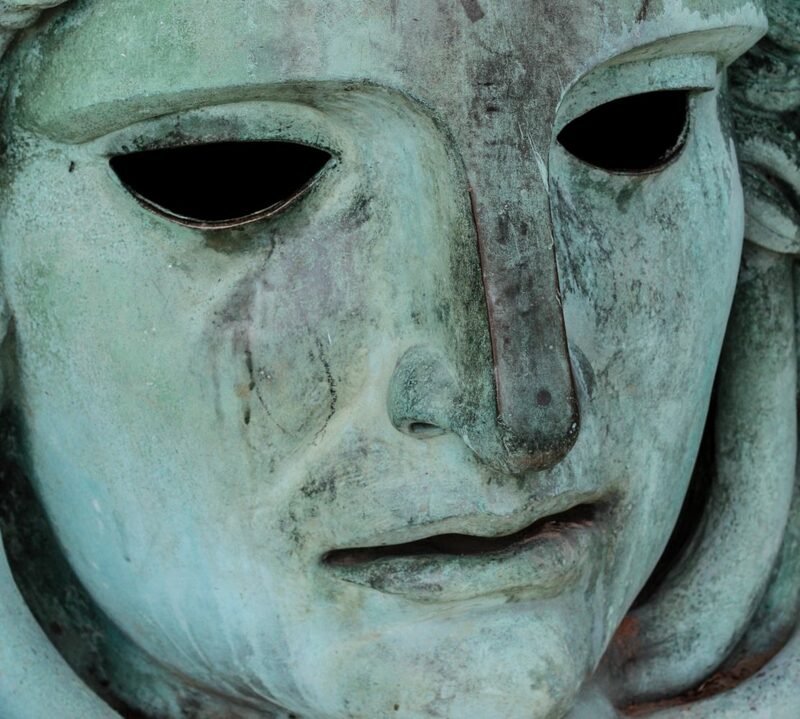 As they were walking past one just ups and slaps Ashlyn on the side of the face–hard. She begins to scream immediately. The mother is trying to scold her son and I’m standing there in shock. I’m giving one of the dirtiest looks I have ever given. I wasn’t able to move. My mind/body wanted to grab the kid and shake him, slap him back, yell at him…with curse words. Controlling myself by giving a nasty look was the only thing I could do. She blurted out that she was sorry, her son is autistic and adhd, but it didn’t sound very apologetic. That’s when the fear for my daughter shifted to compassion for this mother. Ashlyn was already starting to calm down and now all I could feel was remorse for wanting to take her kid to the ground. And of course her apology didn’t sound very apologetic–she probably has to apologize all the time. After walking away and catching my breath I went back over to her (she was still there because right after the boy slapped Ashlyn he beat his own brother and pushed him down) and let her know that Ashlyn was ok. I cried as I walked away knowing that this would affect us for maybe five minutes of our lives, this woman must deal with autism for the rest of hers. After Ashlyn’s first fight we then went to see THE PIRATES THAT DON’T DO ANYTHING!!! That was a good movie, as are most things Veggie Tale (our personal favorite: “Do the Moo Shoo” song on the Ultimate Silly Song Countdown). Reagan is able to sit through a full-length feature now that she is almost six. Ashlyn, who is almost one, was able to go about five minutes before she started commenting on everything like she was on Mystery Science Theater 3000. Fortunately the theater wasn’t crowded and everyone else was in our same situation. We still kept her quiet to the best of our ability. So, there you have it. Our crazy, fun, somewhat violent weekend. OK, to redeem myself from that last post and to show you I can make my way around the kitchen I am posting an original recipe created by me. And it’s been published, so don’t even think about copping it as your own–but please do let me know how it turns out if you try it! This was developed in one of my rare creative moments in the kitchen. I ALWAYS need a recipe. I wish I didn’t, but I don’t have the confidence yet to just throw things together with a dash of this and a pinch of that to suit my own taste. Fortunately I’ll eat almost anything (except leftover cornbread made into bitter cornbread pudding) so I don’t usually feel the need to fly by the seat of my pants. However, this night was different and I decided to become a chef/scientist. Preheat oven to 350 degrees. Mix Italian bread crumbs and flax seed together. Slice chicken breast, almost all the way through. Dip closed breast in egg and then dredge in the bread crumb, flax seed mixture. Open up the chicken breast while it’s sitting in the bread crumbs (this just controls mess) and place the following inside the breast: two pieces of bacon, a small handful of mozzarella cheese and some basil leaves. Close up breast and place in shallow roasting pan. Drizzle olive oil over tops of chicken. Bake until internal temp reaches 165, about 30 to 35 minutes. Yum! Maybe I’ll make that tomorrow night instead of the other experiment I had on tap using the cabbage left over from the Asian wraps. Yikes! I am not gifted in knowing how to regift leftovers so, of course, I searched the internet and came up with two great-sounding recipes. I will not post those here, as they are probably actually good if made either 1) with fresh ingredients or 2)by someone else. The first one was a minestrone soup that used shredded vegetables for cole slaw. It was very easy to make, so I’m not sure where I went wrong. This was the dish that ended up a dud. It wasn’t gross, but I’ll never make it again. Here’s where I went really wrong. For the cornbread I found a recipe that was a response to an inquiry sent out by someone wanting to know how to use leftover cornbread. “Score!” I thought since that was my very dilema. The first clue that I missed: the recipe was unnamed. Second missed clue: no measurements whatsoever. I should have passed this one up, but being adventurous, I bit. I substituded canned diced green chilis for the called jalepenos. Aren’t green onions those long skinny green grassy looking things with little tiny onions on the end? ‘Cause that’s what I thought I was supposed to use. The recipe called for adding this to the crumbled up cornbread then adding milk and egg. It even suggested adding vanilla and sugar…but the thought of adding those with green chilis and onions didn’t appeal to me. It was smelling pretty good baking in the oven. My hungry husband sat with eyes fixed, drool rolling, waiting to scarf some down (because he wasn’t that interested in the minestrone). I pulled it out of of the oven, scooped some on a plate and we took a bite. OMG, it was horrible. There was this aweful, bitter taste…you know when you eat something that’s gone bad or drink rotten milk? Oh, you don’t…well, um…it’s pretty aweful and bitter. I couldn’t get it out of my mouth fast enough. 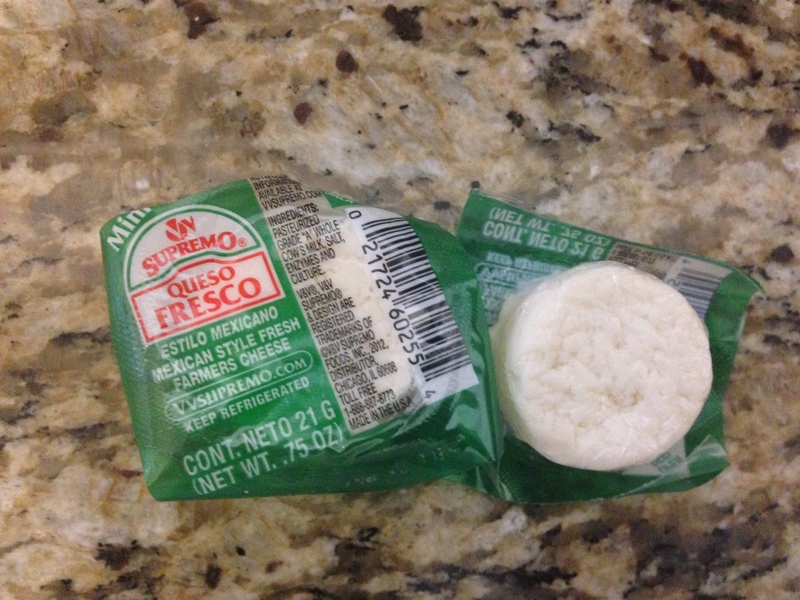 My husband tried to save my ego and make nice by telling me there was just one thing off…if we could just find out what that one thing is it would be delicious. Thanks, Du, but I can see right through that. There’s no way I’m going to try to make this recipe right by trying it again. So, strike one for me on the repurposed leftover front. I’m not giving up though. Some of the best cooks I know reuse food all the time. Du left for church searching the cabinets looking for something portable and edible. Meanwhile, I ended up having a super delicious dinner. Heaven resides on earth in the form of Thin Mints. Thank God for the Girl Scout who delivered my boxes (I will not tell you how many) of Thin Mints last night!